In this communication driven world, we obviously need to handle data in an efficient manner as communication is all about data transmission. To do this, we have databases such as MS Access, SQL Server, Oracle, etc to store and retrieve our data for our day-to-day purposes. Have you ever tried a database? It is not that tough to handle a DB – even you can try it! All you need are syntaxes to manipulate or retrieve the contents of the databases. Let us explain the syntaxes ‘Join’ & ‘Inner Join’ and establish whether they differ in their functionalities or performances. What is ‘Join’ in Database? The ‘Join’ syntax is capable of retrieving the matching columns from two or more databases, or database tables. The databases are always visualized as tables, and they are the actual individual units that hold the data in the form of columns and rows. Each table is constructed using an identifier key that remains unique for every row. All our manipulations are based on those keys – you can learn how to use them by reading further. Before we move on to the differences, let us take a look at the general syntax of the ‘join’. The above syntax retrieves all the matching rows for the specified column names from the tables – Table1 and Table2. You can note that the Column_name is the identifier key in both tables, and the above query compares those to find the matching rows. What does ‘Inner Join’ does? ‘Inner Join’ is a SQL syntax that is functionally the same as the ‘Join’ syntax. 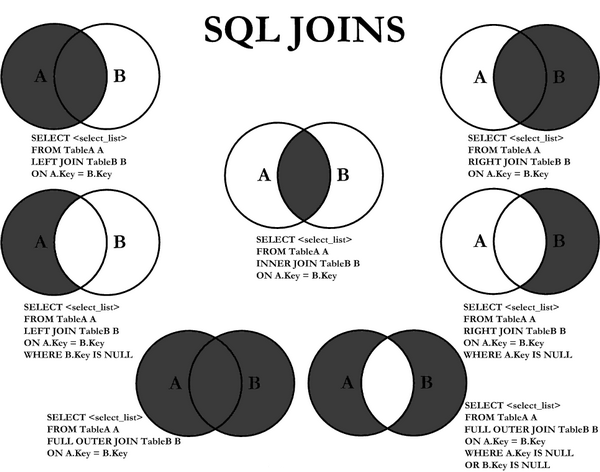 When you replace ‘Join’ with ‘Inner Join’ in the above SQL query, you will get the same result! Shocking, right? Then why do we have two different syntaxes to perform the same function? By now, most of you are probably wondering this; you can learn why by reading further. For a better understanding, take a look at the following image. You can notice the presence of ‘Inner join’ in the above picture, and there is no separate syntax for ‘join’. This explicitly proves that both syntaxes are the same and we do not require an additional diagram to depict ‘join’. There are more ‘Join’ types, such as ‘Outer join’, ‘Left join’, and ‘Right join’. These ‘join’ syntaxes vary significantly in their functions, and we need to be specific in mentioning the proper one. Just because both ‘join’ and ‘inner join’ perform the same function, we might neglect the word ‘inner’ when we code. Sometimes, an ambiguity may arise among fellow developers as to the type of ‘join’ that the developer has mentioned. This is a common problem with newly practicing developers; newcomers have to be specific in writing the ‘join’ statements. And so, we can say that we have a clear ‘inner join’ statement just to avoid confusion with the other ‘join’ types. We advise our readers to go ahead and use the clear syntaxes rather than going for the ambiguous ones. The SQL queries are not restricted to few databases and we use them across a variety of DBs such as SQL Server, MS Access, Oracle, etc. If we consider the MS Access DB, it never accepts a simple ‘Join’! Yes, it only accepts it when you specify the type of ‘join’ – such as ‘Inner join’, ‘Outer join’, ‘Left join’, and ‘Right join’ – that you going to use in your query. Therefore, when you intend to use the same or similar syntaxes in a variety of databases, you should probably write ‘Inner join’ instead of just ‘join’ in your query! There is a difference, even though both are doing the same job. Most people think that ‘join’ and ‘Inner join’ are not the same; to their surprise, they are the same in functionality and performance. We can say that the SQL treats ‘join’ as the short form of ‘inner join’. Though this is not technically a correct statement, we can put it like that for easier understanding. However, be sure to take a few more keystrokes by typing it as ‘Inner join’ – it can save you from other issues that we discussed above. So what’s the best practice, to use ‘Join’ or ‘Inner Join’? We suggest you use ‘Inner join’ in the queries where you planned to only use ‘join’. The former makes sense and looks clear! Additionally, there won’t be any ambiguity as to which type of ‘join’ the programmer intended to use. Moreover, fellow programmers won’t require your help for documentation or understanding purposes. Now, let us recap everything and see how the two syntaxes differ by looking at the following table. 2 For Developers Just the ‘join’ statement creates ambiguity as to which type of ‘’join the developer is referring to. Using ‘Inner join’ in the code is very clear and forms a self-documented code for fellow developers. 3 MS Access DB It accepts the simple ‘join’ statement. It accepts the ‘Inner join’ statement. 4 Short form This can be considered as the short form and cannot be shortened further. The ‘Inner join’can be shortened to just ‘join’. 5 Which is better? Although ‘join’ means the same as ‘Inner join’, a good developer should use clear syntaxes to avoid ambiguities. ‘Inner join’ is better, although it is equivalent to ‘join’ in performance as well as function. Ramalan Harifa. "Difference Between Join And Inner Join." DifferenceBetween.net. June 5, 2017 < http://www.differencebetween.net/technology/software-technology/difference-between-join-and-inner-join/ >.